I was born in Malta on July 10, 1887– at least that is what I am told. I recall a beautiful house and a patio full of flowers–it was close to the mosque in Cordova—and I remember well the day a friend of my mother’s took my left hand and gazed at it in horror: I did not have a Fate Line. I didn’t think about it for long–I took one of my father’s razor blades and cut my own Fate Line, long and deep. I doubt that I increased my dose of luck, but I’ve always been free, and that’s good enough for me. My father was always leaving, and over time he came back less and less often. He was from Tintagel, in Cornwall, a place full of fairies and wizards. He claimed to be the grandson of a witch from Man who had a red cat, but then again, he said a lot of things when he got lost in his bottles. I studied at La Valletta Jewish school and then in Cordova with Rabbi Ezra Toledano. It was he who initiated me into the Torah and told me other secret stories. At any rate, what I remember best is the day I left Malta. I embarked on the Golden Vanity, a magnificent three-masted ship, and ever since then I have been sailing around the world. I have met Rasputin, Jack London, and many others; I learned to dance the tango in Buenos Aires; in the Antilles and Brazil I met Esmeralda and learned about voodoo rituals. Then there were the Indies, China, and the Caribbean islands, with those lazy verandas and shootings; the Pacific Islands, including Escondida–the strangest of them all–among monks and pirates. I saw a train loaded with gold fall into an icy lake in Mongolia; I have shared the desert silences with a warrior, and greenery and tears with a beautiful Irish fairy; and I’ve searched for jewels and impossible dreams along the canals and above the roofs of Venice. I’m not a hero. I like to travel and I don’t care for rules, but I respect just one: I never betray my friends. 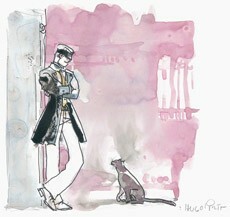 Corto Maltese was born on July 10, 1887 in La Valletta (Malta). His father was an English sailor, originally from Tintagel, in Cornwall. His mother was a gypsy from Seville. His parents met in Gibaltrar, where she went by the name “La niña de Gibilterra” [“The Gibaltrar Girl”] e apparently modelled for the painter Ingres (1780-1867). 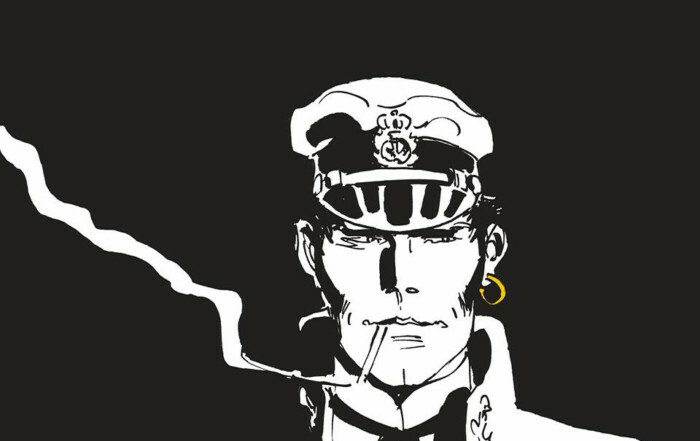 Corto Maltese’s childhood is spent in Gibaltrar, then in Cordova where he lives in the Jewish Quarter. He attends La Valletta Jewish School, run by the Rabbi Ezra Toledano (Corto’s mother’s lover when they were both in Cordova). At the time of the Boxer Rebellion (June-August 1900), Corto is in China. At the beginning of the year, at La Valletta, Corto embarks as a sailor on the Golden Vanity; thus he begins his travels. He stops in Egypt, where he visits the pyramids at Giza. In February he reaches Ismailia, and subsequently stops at Aden, Mascate, Karachi, Bombay, Colombo, Madras, Rangoon, Singapore, Kowloon, Shanghai and Tien’Tsin. Around the end of 1904, during the time of the Russo-Japanese War (February 1904-September 1905), Corto arrives in Manchuria. In Mukden, now called Shenyang, he spends time with the Song family; becomes a friend of the American writer Jack London, who is a war correspondent at the time; and meets Rasputin, a young deserter of a regiment of Siberian riflemen. Corto and Rasputin reach Tien’Tsin together and embark on a voyage to Africa in search of the gold mines of Dankalia. The story “La giovinezza” [The Early Years] tells about this period. In the Celebes Sea, a mutiny takes place on board the ship. Corto and Rasputin, picked up by a merchant ship, reach Valparaiso in Chile and from there, by train, they arrive in Santiago and then in Argentina in 1905. In Cholila, Patagonia, they meet the North American outlaws Butch Cassidy, Sundance Kid, and Etta Place. Corto’s travels begin again. In 1907 he is in Ancona, where he meets the revolutionary Russian Dzugasvili, at the time a hotel porter, but who will become Stalin. In 1908, Corto returns to Argentina, and at the Drowning Maud Hotel, meets Jack London and the American playwright Eugene O’Neill. 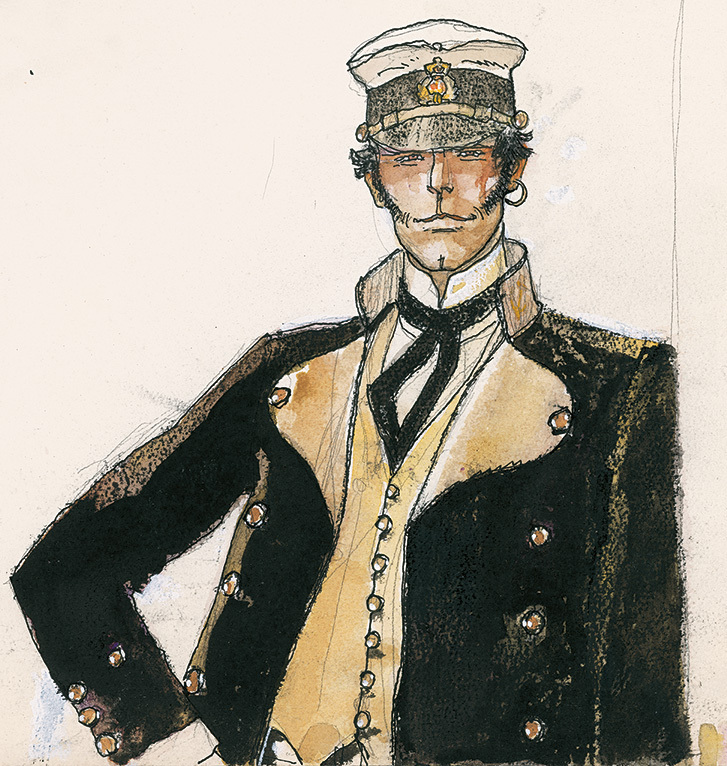 In 1909, Corto is in Marseilles, then in Trieste, where he meets the writer James Joyce. In 1910, he’s second in command of the Bostonian, which transports livestock between Boston and Liverpool. In 1911 he arrives in Tunisia, and in the same year he sets sail for Argentina, but stops off in Salvador de Bahia, Brazil, and spends a good while at Itapoa. In the same period he travels to the Antilles, New Orleans, India, and China in 1913. Corto travels far and wide in Indonesia and the South Pacific: Surabaya (Java), the Samoan Islands, and the Tonga Islands. In this period, having become a pirate, he works for a mysterious character, the “Monk”. 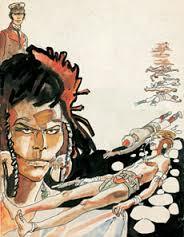 On October 31st, however, Corto Maltese’s crew mutinies and he is abandoned off the shore of the Solomon Islands. The next day, Corto is rescued by Rasputin, who is also a pirate and an accomplice of the “Monk.” November 1st, 1913 is the real start of The Ballad of the Salty Sea. Corto and Rasputin are in the Pacific region, around New Guinea, the Bismarck Archipelago, and Escondida Island (169° West and 19° South latitude, that is, near the island of Niue). On January 19, Corto and Rasputin leave Escondida and head for Pitcairn Island. End of The Ballad of the Salty Sea. From Pitcairn they will stop at Easter Island, Sala y Gomez Island, Iquique (Chile), Callao (Peru), and Guayaquil (Ecuador). In August they reach Panama. Corto Maltese and Rasputin part company in Panama. Corto, accompanied by professor Jeremiah Steiner of the University of Prague, and by young Tristan Bantam, accumulates a series of adventures in Latin America. The stories are collected in the volumes Caribbean Suite, Mare d’Oro, Beyond the Windy Isles, and Sweet Dream Lagoon. The series begins at Paramaribo (Dutch Guiana, now Suriname) with The Secret of Tristan Bantam, and continues in Saint-Laurent-de-Maroni (French Guiana) and Salvador de Bahia (Brazil) with the story Rendez-vous in Bahia. Next comes Sureshot Samba and the Brazilian “sertào”, where Corto encounters for the first time the sorceress Bocca Dorata [Golden Mouth]; and finally, in The Brazilian Eagle, he is on Marajò Island, at the mouth of the Amazon River. It’s the most intense year: seven episodes that unfold in Latin America (the end of Caribbean Suite and Mare d’Oro, Beyond the Windy Isles, and Sweet Dream Lagoon), followed by four stories set in Europe (the beginning of The Celts): Corto is averaging an adventure a month, from February to December. So Much for Gentlemen of Fortune, in which Corto runs into Rasputin again in the Antilles, on the island of Saint Kitts. The Seagull’s Fault, which unfolds in British Honduras (now Belize). Mushroom Heads (the first chapter of Beyond the Windy Isles), set in Maracaibo, Venezuela. Banana Conga, set in Honduras and heralding the appearance of Venexiana Stevenson. Esmeralda turns up as well (Corto met her in Buenos Aires when she was just a child, and her mother, “Parda Flora,” loved him). Voodoo for the President takes place in Barbados (Antilles) and then on the island of Port Ducal, which cannot be found on a map, but according to Pratt is located to the southwest of Guadalupe. Sweet Dream Lagoon is set in the Orinoco Delta. A Tale of Two Grandfathers takes us to the Amazon Forest in Peru. The Angel in the Window to the Orient, the first chapter of The Celts, is entirely set in Venice. Under the Flag of Gold bears an October date for the Battle of Caporetto on October 24, 1917, when Corto meets Ernest Hemingway, who is working as an ambulance driver. The story unfolds on the Adriatic Sea and then at Ulcinj in Montenegro. Concert in O Minor for Harp and Nitroglycerin is set in Dublin, Ireland. A Midwinter Morning’s Dream takes place in England, at Stonehenge and perhaps also in Tintagel, around the 21st of December, Winter Solstice, for the very reason that Shakespeare’s Midsummer Night’s Dream occurs on the 24th of June, the Feast of Saint John, when the Summer Solstice is celebrated. 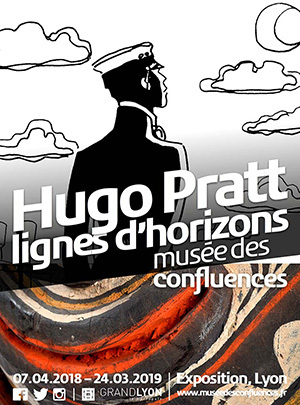 In the spring, Corto Maltese is in France. In fact, the last two chapters of the story The Celts: Côtes de Nuits and Picardy Roses take place on April 20 and 21 on the Somme, between Corby and Bray, where Corto witnesses the death of the Red Baron, that is, of the German flying ace Manfred von Richthofen, shot down at Vaux-sur-Somme. Burlesque between Zuydcoote and Bray-Dunes, on the other hand, unfolds on the beaches of the North Sea. A month later, Corto is at Turban (perhaps al-Turbah), Yemen (In the Name of Allah the Merciful). Here, he meets Cush, in an episode that makes up the first chapter of The Ethiopian. In September, Corto is in British Somalia; (The Coup De Grace unfolds in just one day, September 13), then in Ethiopia (More Romeos, More Juliets), and finally he is in German East Africa (now Tanzania). This last episode, The Leopard-Men of the Rufiji, is dated October 1918.On November 11, Corto is in Hong Kong, where he owns a house (although his legal residence is in Antigua, Antilles). Here he learns that the war is over, and finds Rasputin again. Thus begins In Siberia. Corto is in Shanghai, then on the borders of Manchuria, Mongolia, and Siberia, in the region of the city of Manzhouli. Corto, somewhere between Manzhouli and Lake DaliNor (o HulunNur), is injured in an attempt to destroy the armored train of General Tchang (February). He succeeds nonetheless in reaching Hong Kong by way of Hailar (Inner Mongolia) and Harbin, in China. He is in Hong Kong during the first half of March, and shortly after the 15th of the month he departs once more, this time headed for the Chinese province of Kiang Si (Xian Jiang), where, in April of 1920, In Siberia ends. Corto is in Venice. The story Fable of Venice unfolds between April 9th and 25th. In the fall, Corto leaves for Rhodes, where the episode The Golden House of Samarkand begins. For about a year, Corto Maltese searches for the treasure of Alexander the Great (and he will get a glimpse of it) as well as for Rasputin (whom he will succeed in locating). Having left Rhodes, he arrives in Adana (Turkey) in December, crosses the country as far as Van, enters Azerbaijian, and reaches the Caspian Sea (which he crosses in a boat from Baku to Krasnovodsk), ending up in the Emirate of Bukhara. Here he meets up with Rasputin, who has just been released from a prison called the “Golden House of Samarkand,” near Baldjouan, to the southwest of Duchambe (now the capital of Tajikistan). Here, Corto and Rasputin witness the death of General Enver Pasha on August 4, 1922. They then go to Kafiristan (a region of Afghanistan known today as Nuristan). The Golden House of Samarkand ends on September 6, 1922, when Corto and Rasputin cross the border between Afghanistan and Pakistan (the latter was part of the British Indian Empire at the time). 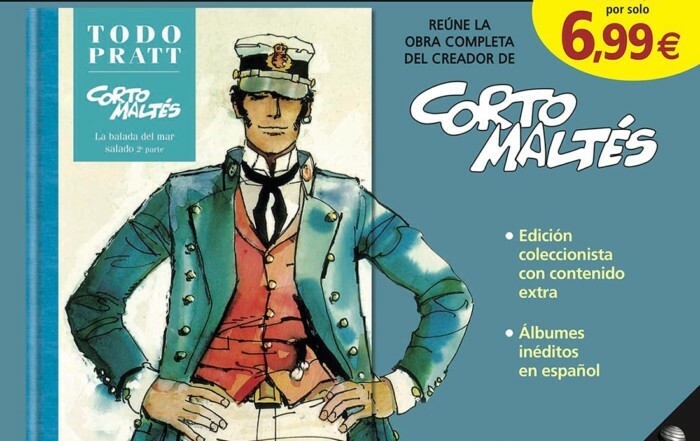 At the beginning of June, Corto Maltese returns to Argentina after fifteen years. He travels there on board the steamship Le Malte of the shipping agent Spedizionieri Riuniti, which travels between Hamburg and Buenos Aires. Tango begins on June 13 and ends on the night of June 20th. Corto visits all the Swiss cantons. In The Secret Rose, after a retreat in the small village of Savuit-sur-Lutry (Vaud Canton), in the fall Corto and professor Steiner go to Montagnola (Ticino Canton) to visit the writer Hermann Hesse, after which Corto goes to Zurich with the painter Tamara de Lempicka. While in Tarifa (at the southernmost tip of Spain), Corto and Rasputin receive a telegram from Venezuela from their friend Levi Colombia, who invites them on a cruise in the Caribbean in search of Atlantis. Thus begins the story of Mü. Not much is known about Corto Maltese’s life in this period. In December 1928 and January 1929 he is in Harar (the Ethiopian city where Rimbaud lived), in the company of the novelist Henry de Montfreid and the paleontologist and theologist Teilhard de Chardin. In July 1936, the Spanish Civil War begins; it will last until May 1939. Corto enlists in the International Brigades, fighting alongside John Cornford (son of the English poetess Frances Croft Cornford, Darwin’s grandaughter). Then we lose Corto’s traces. In The Scorpions of the Desert, Cush, in January 1941, says about Corto Maltese: “He seems to have gone missing during the war in Spain”; and so we learn that Corto had sent Cush a hawk, Al-Andaluz, from Spain. Did Corto disappear after the “last romantic adventure,” the Spanish Civil War? Perhaps, but there seems to be a letter written by Pandora which says that Corto and Tarao, by now up there in age, went to live with her and are considered “uncles” by her children.